Deb Smith and Cindy Uhrich began exploring the idea of opening a small business long before retiring from South Puget Sound Community College, where the two friends worked for over 20 years. 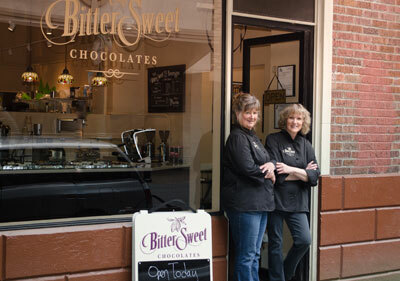 They wanted to remain active in the Olympia community while putting to use their unique, but complementary, backgrounds: Smith, as a talented instructor of Baking and Pastry Arts with a love for making chocolates; and Uhrich in events management. The two draw on their experiences, childhood memories and favorite foods for inspiration. Uhrich recounts that when they first sat down to create their flavor profiles, they categorized them—Downtown After Dark Collection, Coffee & Tea Collection, Garden & Spice Collection and their Nostalgia Collection; plus Lemon Tart, Peanut Butter, Donut, Coconut Rum, Malted Milk and Mint. “Favorites from our childhoods,” she says. 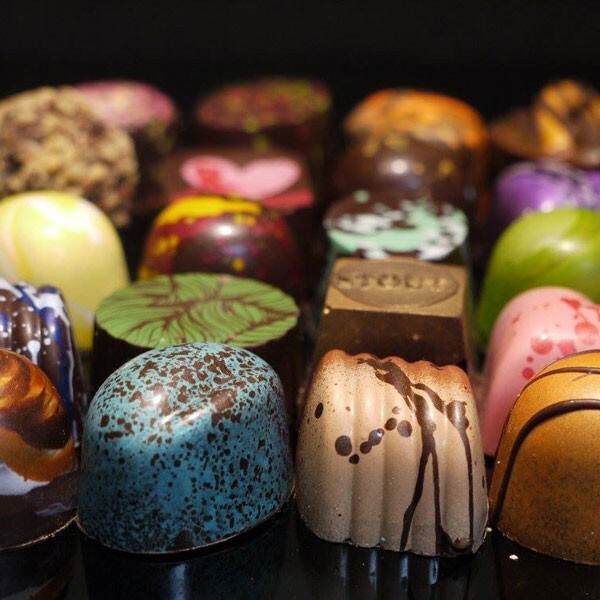 The daily selection includes an array of 24 standard chocolates and seasonal offerings. Sugar-free and dairy-free options are currently in the works. Everything is made on-site using direct-trade chocolate from Venezuela and the Dominican Republic. and tastings that pair beer and wine with chocolates. Unable to make it to Olympia? Keep an eye out for online sales coming this fall. For tasting or more information about the latest offerings, visit Bittersweet Chocolates at its location in downtown Olympia at 513 Washington St. SE or online at bittersweetchocolatesllc.com.